Have you ever recorded yourself and listened to the sound of your own voice? What did you discover? Did you sound the way you thought you sound? In many ways, the voice we have is a result of our genetics. However, we do have methods and techniques that will allow us to change the quality of our voice, according to the needs of a character. But even if we are going to use "our own voice" for the character, we want to be able to speak with clarity, good volume, and a pleasing sound. Vocal Warm-ups not only promote healthy vocal production, but warming up daily increases our ability to use our voices to their fullest potential. At first, when we perform the tongue twisters, for instance, you may find them difficult. But like all warm-ups, it is important to go slowly until you get the hang of it. Look to the next column for more details! These are the parts of your mouth that are responsible for forming the consonant sounds ('b', 'ch', 't', 'la', 'ma', 'na', 'ga', etc.) by stopping or modifying your air flow. They include your teeth, lips, tongue, and palate. Without air, we can't...well....live. 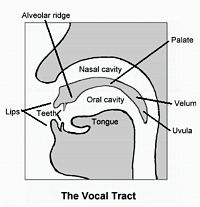 But having no air to push across your vocal cords also makes speech very difficult! So, what provides the air you need to produce your voice? You guessed it: your lungs! 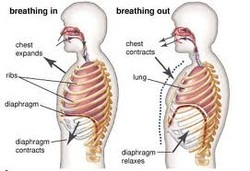 But what is that muscle responsible for pushing that air out of your lungs? That's right! Your diaphragm (DIE-uh-fram).